[embed]https://www.youtube.com/watch?v=LWJdtaICuCc[/embed] I wonder what other professions he'd say you cannot fulfill unless you'll stand for the national anthem? The league's 32 owners decided on Wednesday to overhaul N.F.L. policy on the protocol for the national anthem. Under the new rules, "all team and league personnel on the field shall stand and show respect for the flag and the Anthem,” those who choose not to stand may stay in the locker room while the Anthem is being performed, and "a club will be fined by the League if its personnel are on the field and do not stand and show respect for the flag and the Anthem." I get why they did it - they don't want to be at war with the President or his red-state supporters at a time when television ratings are in the tank. Audiences for NFL games are down 20% from just two seasons ago. And according to the New York Times, “while it is impossible to know how much of that is a result of fans being turned off by the protests during the anthem, industry experts... have said data show the N.F.L. 's handling of the issue is at least partly to blame for the drop-off." But here's my prediction: the NFL just made it worse. First, how long will it take for someone to come up with a standing form of protest? 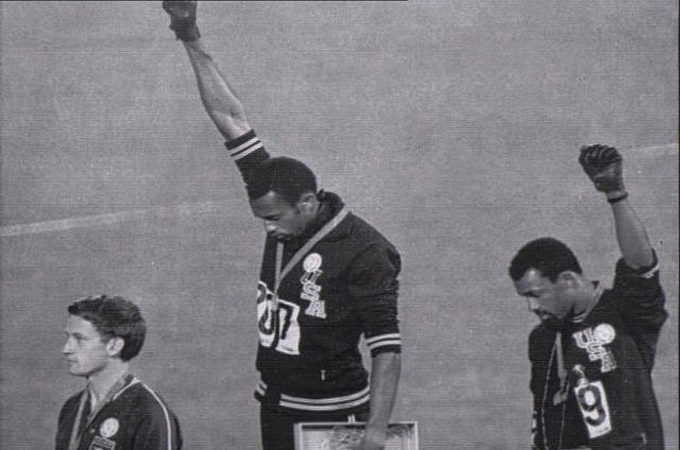 Anyone remember John Carlos at the Olympics? I'll take the over-under on the first week of the new season. Second, prohibiting the players from taking a knee flies in the face of what the flag represents. I know it's a cliche, but people really have died for Colin Kaepernick's right to take a knee. By the way - I don't like him taking a knee - I wish he wouldn't take a knee, but I don't think he should be blackballed for expressing himself. I stand with the Times editorial board, which said that the NFL owners and the President had concluded "that true patriotism is not about bravely standing up for democratic principle, but about standing up, period. Rather than show a little backbone themselves and support the right of athletes to protest peacefully, the league capitulated to a president who relishes demonizing black athletes." Here's my other observation: news coverage says this move was aimed at "seeking to end the controversy that has embarrassed the NFL". Well, the only thing I am positive about is this has not ended the controversy. It has reignited it. Five years ago, a federal appellate court settled a Pennsylvania dispute in which two female students challenged their school's ban of bracelets that read "I heart boobies." The bracelets were in support of a breast cancer awareness program. The kids loved wearing them, this one school district made a huge to-do over it, saying they were "lewd". Well, I knew when this happened that the school was making things so much worse. Usually, such a fashion item would be a passing fad like a yo-yo and soon forgotten. But when a school says you can’t wear them? Kids get their back up and wear them defiantly. And after years of litigation about free speech rights, the 3rd circuit court of appeals ruled in favor of the kids. By making this a point of contention, and saying you can't do it, the NFL is perpetuating the conflict. Now it'll be about who's staying in the locker room and who's standing in a slouch.